Description: The Back Bone Of Your RTO compliance… meeting the Standards for RTO requirements. You will find templates, policies, procedures and forms that provide you with the insight to creating a compliant RTO … The information is easy to use, and provided in formats so you can customise. The RTO systems are the cornerstone to your RTO complaince, to meeting your contractual obligations, and it is how you work within your RTO. So whilst it is an area that is often forgotten, it is one that needs regular updating. 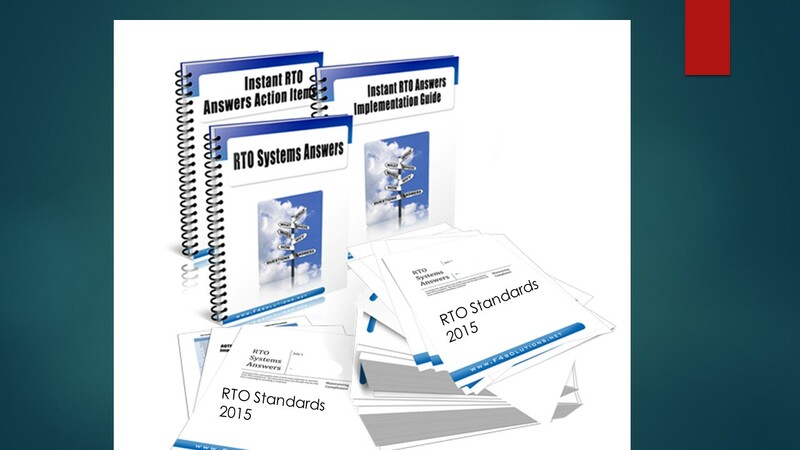 When you purchase this product from RTO Mentor you recieve forms, procedures from years of operating RTOs. All materials are pre-written and contain all the required policies, procedures, forms, templates and registers to meet your RTO compliance. Whilst the materials are pre-written they still need you to make them your own by placing statements about your intended RTO, your logo and name placed into them. If you have old policies and procedures that need to be updated, why not start afresh. Save time and effort by knowing they meet the RTO Standards, and will support your RTO and it’s processes. These manuals are the back bone of the RTO business. The Quality manual is complete with policies and procedures that meet all the Standards. The Student manual is information that needs to be advised to a student before they enrol with your RTO, and is easily amended to suit your specific RTO and your clients. The HR manual details procedures for your staff, contract or on your payroll. The Trainer and Assessor manual supports your staffing solutions for the ability to run an RTO. Templates for developing assessments, mapping, decision making on assessments, assessment validation, developing training strategies, training specific for clients, recruiting staff, inducting staff, safety, developing training, managing your RTO and many more. Everything meets the requirements for TAC and you’ll discover there is actually more then you may need, however I want you to have the systems, forms etc. available to you when your business expands. To make it easy for you I have put everything logically into folders. This way you can start organised and continue building your business.